If you, like me, didn’t have 90 minutes to spare this past Sunday to find out what kind of confusion Westworld Season 2 would end on, you probably spent the next day dodging spoilers. It’s times like these where the “mute” option on Twitter is a busy movie and TV fan’s best friend. But what about Facebook? Any and all spoilers can creep onto your News Feed when you’re just trying to wish your cousin a happy birthday or respond “Maybe” to that college friend’s poetry reading. Thankfully, Facebook now has their own feature to protect you from spoilers and any news you want to avoid. The platform began rolling out a new feature this week that allows users to block certain posts from appearing in their News Feed (h/t Indiewire). 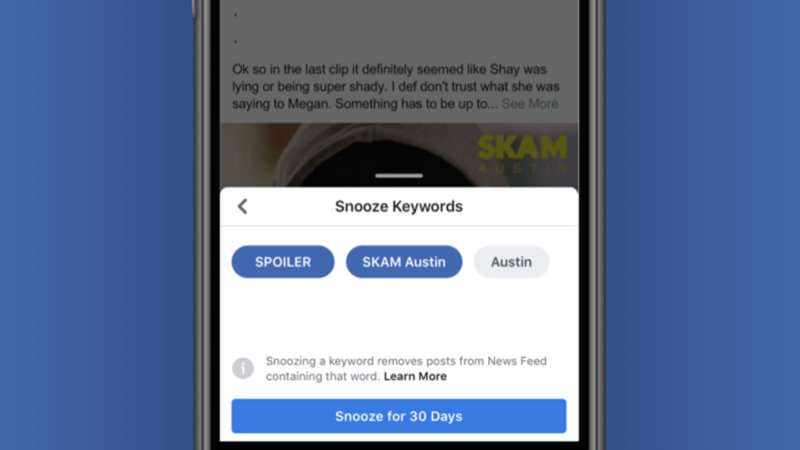 The new “Keyword Snooze” feature lets you temporarily hide posts with certain keywords. So if you’re behind on Westworld or The Handmaid’s Tale, or if you still haven’t gotten around to seeing Avengers: Infinity War and are pissed at all the headlines spoiling the ending, you’re in luck! There’s just one annoyance though. Unlike Twitter’s “Mute” option, on Facebook you have to see a post with a keyword first in order to block it. So that means you may end up getting spoiled before you can hide spoilers. (If you’re real serious about remaining spoiler-free, just have a friend put a bunch of keywords in a post and block ‘em from there.) Once you block a keyword, you won’t see any posts with it from any user, Page or Group for 30 days. If you still aren’t caught up on Westworld in a month, no worries, just re-snooze it. The feature only works on text though, and it’s unclear if that applies to just the text of a post, or also to headlines and link URLs. It’s a pretty cool idea for film and TV fans (and anyone needing less Trump news in their feed). I like the 30-day expiration too. I know I’ve completely forgotten about the mutes I’ve set on Twitter – I couldn’t figure out why no one was tweeting about Orange Is the New Black for months, then I remembered. Hopefully this feature rolls out for everyone by the time Game of Thrones returns next year.